The ultrasonic measurement is an important experimental technique to study the elastic properties of the condensed matter systems. 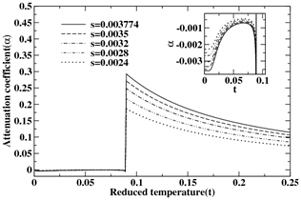 We present here a microscopic theoretical model to study the effect of staggered magnetic field on the temperature dependent ultrasonic attenuation coefficient (α). We consider a model Hamiltonian consisting of staggered magnetic field in the conduction band of the cuprate systems. The effect of temperature dependent staggered field on α is investigated. In order to study its effect on the ultrasonic attenuation (α), we have calculated the phonon Green’s function. The imaginary part of its self-energy directly gives the attenuation coefficient (α). As temperature is lowered, the attenuation coefficient increases, forms a peak at the Néel temperature (TN)) and then the coefficient α shows large suppression in the anti-ferromagnetic (AFM) phase in the lower temperature region. The effect of the model parameters of the system on α are reported in the present communication.